3D Tour Available! Grab this darling ranch and get in the #1 school system in Indiana! You won't find a better location that is close to everything in the heart of West Lafayette; walking distance to schools, community pool, trails and more. Bright, natural lighting throughout the home in the spacious living room, den/office and additional large bonus room. Huge kitchen features warm cabinetry with lots of storage, hardwood floors, solid surface counters, stainless appliances, and kitchen island with breakfast bar seating. Separate eat in area. Just off the kitchen is den that could be used as a formal dining room or office with views of the backyard. Master bedroom is a great size with hardwood floors, walk-in closet and adjoining bath featuring soaking tub, stand-up shower and dual vanity. The two additional spacious bedrooms on the main floor also have original hardwood floors, and adjoining Jack & Jill bath. You could almost double the square footage of this home by finishing the rest of the basement. Your guests or teenager will love the privacy of the bedroom and separate sitting/study area on the lower level. Bath is plumbed in the basement, shower already installed. Currently used as storage. All the kids and neighbors will want to hang out in your spacious yard, over 1/3 acre that is fully fenced with mature trees and private from your neighbors. Plenty of room to add a pool! Huge deck for grilling and having summer meals. Detached garage. 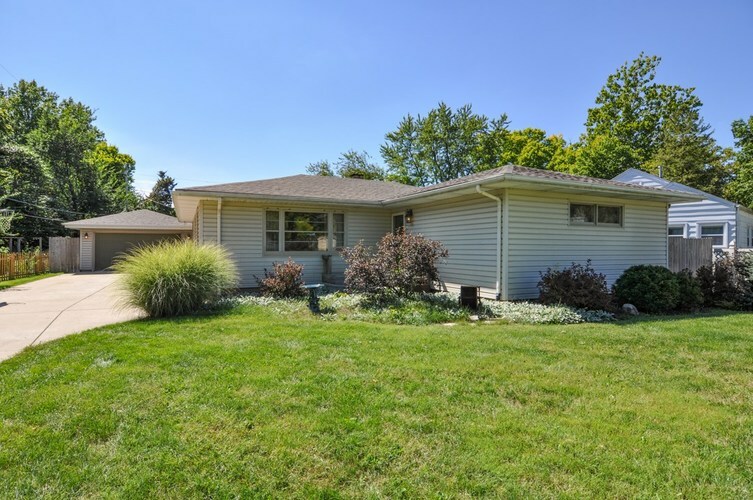 Don't miss this opportunity to own this charming home in West Lafayette schools.